The Heart is considered the seat of feelings, of psychic activity. But this is just a relative and individual dimension of the Heart. The world of individual emotions, the human soul, is to be overcome through detachment for revealing the true universal significance of the Heart. So, Atman, the Spiritual Heart, has no physical or mental dimensions as such and does not express itself other than as a mere transfiguring tremor. But as yogis say, unquestionably God exists and He alone is real. According to Tantric tradition, anahata chakra, the heart chakra, is just a level or dimension of our being and of the entire manifestation. The Spiritual Heart is more than this. Hridaya: The Spiritual Heart is not just a spark of God; the Spiritual Heart is God. The relationship between atman and Brahman is one of unity. Jnana yogis used to express this paradoxical view by saying that Atman (the Spiritual Heart) and Brahman (the Absolute) are one. “This Atman is Brahman,” otherwise known as “Ayamatma Brahma,” is one of the four Mahavakya or great affirmations (we could say suggestions or powerful ideas) of the Vedic and Upanishadic traditions. The key to understanding the nature of the essential Oneness of the Universe is to see our Heart – our eternal, undying Self – as identical with Brahman. Another mahavakya appears in Chandogya Upanishad: “Tat tvam asi”, which translates that the Ultimate Reality, Brahman, is what you are. So the Spiritual Heart is not just a reflection of everything. It is the Supreme Consciousness, the essence of everything, the background of existence. The Whole, Unity, is completely us. In the meditation for the Revelation of the Spiritual Heart, we are all revealing the same Heart, the same Divine Self, the same Ultimate Reality. The Heart of man and the Heart of the world are a single Heart. This is our approach in the Yoga of the Spiritual Heart, in our retreats and workshops. We try to give the inspiration for surrender into the Heart, into the Supreme Reality, into God (but God felt beyond any concepts and religious denominations). In this way, we realize our identity with the Whole, with the totality of Life. Where should we place our focus? If we accept the existence of this area of our body as having a privileged place in revealing who we really are, then, as Ramana Maharshi noted, it follows logically that this is the main point on which our mind should focus while in concentration or during meditations. Where should be the natural place of the Witness Consciousness? When we recognize the necessity of being aware of ourselves – of maintaining a witness consciousness – as a fundamental spiritual attitude, it is best to center ourselves in the region of the middle of the chest. This is an important action and it will help us to understand clearly that the essential awareness of our own being is not a function of reason. It is not the mind or a product of the mind, nor is it ordinary thoughts, but it is a radiance emanating from the region of the chest. Placing the seat of witness consciousness in the brain is a sterile attitude. The ultimate witness is not the mind or a particular thought. We can imagine in our mind a witness of our thoughts and then we can easily imagine another witness of that first witness of the thoughts, and then a witness of the witness of the witness and so on…. The mind can play the game of witnessing ad infinitum. Only if we place the witness consciousness in the Spiritual Heart, in that place of deep intimacy from which arises the intuition of who we are, can we then realize the presence of the ultimate Witness. This issue is not to be argued theoretically by the mind. This is revealed in meditation. The Heart is limitless and, because it has no form, it can contain totality. It is important to note that the rapport of something infinite, atman , the Divine Self, to something finite, such as the physical body or a point on or within the physical body, can only be a relative undertaking. Sages like Ramana Maharshi affirm that the awareness of the Supreme Infinite cannot be localized at a certain place in the body and that in the state of divine expansion, of diving into the divine ocean of Consciousness, we can no longer speak of a head, arms, body, and other areas. However, Ramana says that in the moment of returning to the consciousness of the physical body, when we regain awareness of our physical body, a memory endures of that state and it appears to be connected to the area of the physical heart, in the middle of the chest, slightly to the right. That Divine Infinity can easily be found again by centering in the region of the heart. Christian mystics also speak of lowering the mind to the Heart. In this retreat the object of meditation is not the breath or bodily sensations, feelings, or mind as in other retreats, but rather the Spiritual Heart, Atman, the Divine Self. However, as the meditation goes deeply, the Spiritual Heart will cease to be simply an object of meditation. We will become aware that it is also the Subject, the witness consciousness, the very profound and intimate Self, the very source of our meditation process. So we will understand that the Spiritual Heart is much more than a concentration or meditation object. This will help us to know directly another approach to meditation and spirituality. The Heart will become at the same time the source of attention (the knower), the instrument of knowledge, and the object of knowledge. This kind of meditation is a process which starts from the Heart, and returns to the Heart. The rapport between the mind and the Heart: Conquer or surrender? The Divine Reality of Existence, the present, the “I am,” resides in the Heart; the cerebral man is a limited man. In this way, we pass from the usual “conquering” attitude of the mind to a receptive, contemplative disposition. It is a kind of surrender, which implies lucidity, discernment, vigilance. There we can still speak about an action, but it is of a completely different nature. It is more like a radiance of pure presence, not an action of the ego. The last duality that exists in meditation: the void in the mind and the plenitude of the wholeness in the Heart! How can we build a subtle organ of perception? In this phase, the attention not only derives from the mind. It becomes the attention of a sui generis superior cognitive organ. It is an organ of non-mediate knowledge, jnana, which brings the intimate intuition of what we really are. This new organ of knowledge is formed through the functional identity between the attributes of the mind and those of the Heart. The attention of the Heart-mind implies more an attitude of waiting, an orientation toward a state beyond the rational mind, a domain of peace, of sacredness. Consequently, the premise of the state of surrender is created by an active, superior attention in which the Spiritual Heart is, as we already mentioned, at the same time the source of knowledge (the Knower), the means of attention (this subtle organ of Spiritual Knowledge), and the target of our attention (the object of the attention). So we can speak about an attention that emanates from the Heart and ends up in the Heart. But in this journey from our individual Heart to God’s Heart, in this Knowledge, jnana, we realize that everything is encompassed, the whole Creation, Brahman, the Absolute itself. It follows that the real Knowledge, jnana, resides in the Heart, in the very core of our being. The revelation of the Spiritual Heart leads this wisdom to completely penetrate our being and thus it illuminates us with its brightness. The best way of keeping the awareness of the Spiritual Heart is to love. That’s why jnana, the direct knowledge, is so related with bhakti, which means love, devotion, zeal, fervor, heartiness, ardor, adoration, ecstasy. “God is born in the Heart and the Heart is born in God,” as the great Christian mystic Meister Eckhart said. This vision leads us to understand that there is nothing to be searched in the interior or exterior. God is already there. The Bliss of Pure Existence, sat, is expanding the soul and the understanding. The Divine Reality is unveiling a mystery of love-awareness. In Christian spirituality, and for the Fathers of the Desert, the Heart is not simply a physical organ, but is the spiritual center of the human’s being, his deepest and truest self, or the inner shrine, to be entered only through the sacrifice of individuality, in which the mystery of the union between the divine and the human is consummated. In the vision of the Desert Fathers, there is an organ of contemplation known as “the eye of the Heart” or “the intellect of the Heart,” nous. This nous dwells “in the depths of the soul,” representing the innermost aspect of the Heart. For them nous, “the intellect of the Heart,” is the highest faculty of man through which he knows God or the inner essences by means of spiritual perception or direct apprehension (St. Isaac the Syrian used the term “simple cognition”). “The intellect of the Heart” does not function by formulating abstract concepts and does not reach conclusion through deductive reason. It understands Divine Truth by means of immediate experience or intuition. For the Fathers of the Desert, nipsis or “guarding of the Heart,” watchfulness, represents spiritual sobriety, alertness, vigilance. It signifies an attitude of attentiveness in which we are almost continuously aware of the Heart. The main manual of their tradition is The Philokalia (a collection of texts on the disciplines of Christian prayer and a life dedicated to God), which means “Love of the Beautiful.” The Beautiful is understood as the transcendent source of life and the revelation of Truth. The Greek title for The Philokalia is The Philokalia of the Niptic Fathers, i.e., of the Fathers who practiced the virtue of watchfulness. This shows how central they held the awareness of the Spiritual Heart. The same attitude is promoted in Hridaya Yoga, in our retreats and workshops. b) The other is oriented toward “exterior.” This is the eye through which the Supreme Subject, the Inner Knower, God, or the witness consciousness is witnessing the world. For these traditions, this place, deep in the Heart, is the symbol of the point of contact with God. In the same manner in which the mind is trained in school through the process of education, our Heart (seen here as the organ of spiritual perception) needs to be cultivated. In the domain of the Heart, most of us are somewhat or entirely illiterate. Of course, the process is different because its attributes are different. Art and contemplation represent some of the way to cultivate our Spiritual Heart, but the best method is through meditation for the revelation of the Spiritual Heart and Love. Any authentic spiritual school should induce or even “teach” the sacred principles of the kingdom of the Heart: pure love, yearning, fervor, the sacred tremor, the aspiration for God. A Hridaya Silent Meditation Retreat can be compared in some aspects with an initiation ritual. The role of the most important rituals in ancient traditions was to eliminate the discursive and reflective tendency of the mind and to dissolve the force of identification, which keeps alive the citadel of individuality. In such moments, a complete silence of the mind was necessary before entering the sanctuary (which corresponds with the secret chamber of the Heart). It was thus that the initiates were able to rise above their egos, their personal existence, toward that which they called the Being of Being, toward the Supreme Essence. The Heart is a subtle organ of wisdom, of that so-called “transcendental intellect.” It has been said that: “The rational mind cannot understand the reasoning of the Heart.”Because it cannot be understood by the rational mind, the role of the Spiritual Heart is ignored and even denied. In refuting spiritual intuition, which comes from the Heart, to focus only on reason, the illuminating role of the Heart is abolished. Rational thinking is called reflection because it is, in fact, a reflection of the energy of the Heart. Because of this, ancient traditions held reason, rationality, to be just a capacity for mediated, reflected knowledge. The mind knows through a process of acquiring information. The Heart knows through surrender, trust, and joy. The knowledge of the mind is sequential; the knowledge of the Heart is instantaneous and undivided. It is revelation. It is holistic. It reveals advaita, non-duality. Even the corresponding traits of these two organs are symbolic in and of themselves: radiant presence in the Heart and reflection, discursive intelligence in the mind. The mind is, in fact, just a tool for adapting ourselves in the world. Intuition, which comes from the Heart, is divine, because it represents a direct participation in the universal spiritual wisdom. The Heart, being the Spiritual Sun, is an image of the Center. It is considered the place of revelation, the vital center of being, and the source of the deepest intuition. The Heart is a “theophanic” organ (theophany is a visible manifestation to humankind of God). It is a sacred symbol par excellence. The mind is thus an imperfect instrument with an inherent inability to understand and realize atman. According to Ramana Maharshi (based on the Advaita Vedanta tradition), this primordial subtle energy ascends from the Heart to the mind, through an energy channel (known as atma nadi). Here it feeds the process of thinking and implicitly the individual consciousness with all its attachments and hopes, illusions and suffering. That’s why the mind is seen as a Moon which simply reflects the light of the heart’s Sun. Coming back to the Heart, all the vain noise of the world is quieted…. The Heart is a sanctuary of silence. There, in the most sacred intimacy and solitude of the “cave of the Heart”, the moods of individuality fade away and the consciousness of unity is revealed. There, the world and man are one. So, in a paradoxical way, the solitude and intimacy of the Heart reveals the essential Unity of all existence. In our times, the connection between our superior intuitive intelligence and the Heart has mostly been forgotten. Even if we generally accept the idea of the existence of a Spiritual Heart, we tend to accept it symbolically. 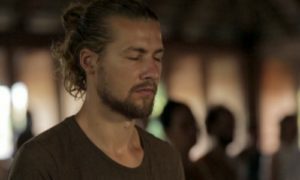 Hridaya Yoga and the Hridaya Silent Meditation Retreat start from the premise that the traditional ideas about the Spiritual Heart can and should be applied in very concrete and practical ways. The Heart, seen as an organ of direct knowledge, can and should be trained constantly in order to increase its purity and capacity to Love, witness, surrender…. In this way, the borders of individuality fade away, and through the recognition of its fundamental attribute as a gateway to infinity, the Supreme Self, atman, is revealed.